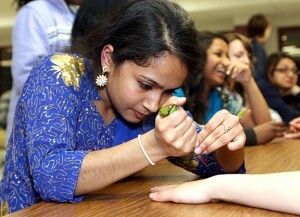 Nadia Zani, originally from Bangladesh, draws henna designs on Abbey Crouse during the Naugatuck Cultural Heritage Fair March 24. NAUGATUCK – The aroma of fresh empanadas, tandoori chicken, and apple pie lured visitors into the high school cafeteria the evening of March 24. The food and the people were brought together in celebration of the cultural diversity of the borough at the Cultural Heritage Fair. Such a confluence of different traditions could only happen in the United States, according to Mayor Robert Mezzo, whose Cultural Council helped organize the affair along with world language department head Anne Marie Chuckrey and high school Principal Francis Serratore. “No other country has had people come to it from all over the globe and blend into one community, taking the traditions and success from the countries from which they brought them, but then blending that into a fabulous American culture. This is the American experience in the world, and you are a part of it tonight,” Mezzo told those who came together for the festivity. During the first half of the evening, students and residents shared their cultural heritage through tables set up with displays of clothing, art, music, and information about their countries of origin. Veronica Jimenez stood behind a table spread with all the accoutrements of Mexico – a sombrero, mariachi dolls, tequila, various crafts, tortilla machine, and even a Mexican bingo card. Jimenez moved to the United States from Mexico in 1997 to have a better life, she said. “It was a big challenge to come here and to establish and to learn English, to learn many new traditions and a new life,” Jimenez said. Jimenez didn’t know any English when she moved to Naugatuck, but she studied at Naugatuck Valley Community College. She said she still cooks Mexican food, throws traditional parties and speaks Spanish with her two children. Somchine Sounanthanam has a similar story, though she comes from a very different part of the world. She moved to Connecticut from Laos in 1980 during the civil war that followed the Vietnam War. Sounanthanam said the only trouble she had adjusting to life in the U.S. was learning the language and the food. Sounanthanam said her French background made it easier to learn English, but it was still difficult starting from scratch. Still, she chose to move to the United States rather than a French-speaking country because of the U.S.’s ideals. “That’s one thing we believe in our heart is that the United States offers freedom. And free enterprise, and free capitalism, and freedom of everything. And we feel that this is the best place for democracy,” she said. She said she still practices religious ceremonies from her home country, including weddings and baptisms, as well as secular traditions like woven silk clothing and dances. “We are part of the modern world in the United States, but we still have that heritage that is part of us,” Sounanthanam said. Other presenters at the event have passed traditions from their parents’ countries down to their own children. Former Mayor Joan Taf speaks Polish, which she learned from her mother and husband, who was raised in Poland, but has never set foot in the country herself. She had tickets to fly there 1988, but backed out at the last minute and sent her daughter there in her place. Even so, Taf’s family practices many of the traditions from the motherland. At Easter, she explained, they bless their food, then divide their eggs and go around the table wishing everybody health and happiness. Taf enjoys Polish cuisine, including pirogues and kielbasa with sauerkraut. Many people have found ways to blend their native culture with the one they found in the United States. The Naugatuck Chamber Singers perform "Jablu Jesu," an African song, during the Cultural Heritage Fair March 24. Harloveleen Kaur moved to the U.S. from India in 1997 to be with her husband. She said she enjoys going to a church similar to the one she went to in India, but she also celebrates American traditions. Kaur’s daughter, Naugatuck high school student Aaseesdeep Kaur, came with her to the United States when she was only a few months old. Aaseesdeep Kaur keeps her hair long like the women of her Indian village. “We love Indian music, Indian food – that’s what we eat every night. We haven’t lost our culture, even though we’ve adopted many others,” Aaseesdeep Kaur said. Culinary arts students and the food service department prepared some of that Indian food, along with cuisine from all over the world, for guests to sample at the event. 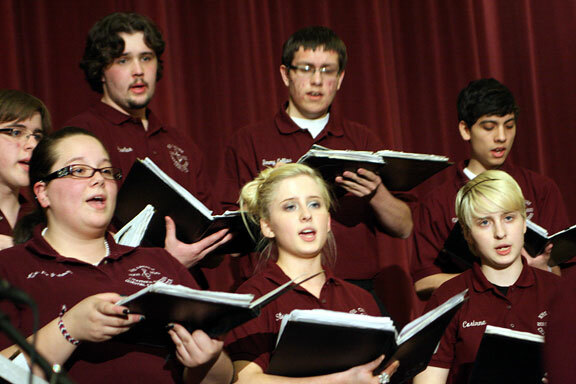 During the second half of the evening, high school students and a few community members performed songs, dance, poetry, and other cultural demonstrations in the auditorium. Several students presented slideshows on various aspects of their home countries and countries they had studied. “It just brings a richer sense of community to our Naugatuck where everybody’s participating and everybody’s showing their heritage and everybody’s is kind of bringing it all together as one and this is what makes Naugatuck a great town,” said Ralph Roper, chair of the Naugatuck Cultural Council. The event brought in about 100 participants and several times that in audience members. “I think for the first time, it was a tremendous success,” Roper said. Chuckrey brought the idea for a cultural fair to Serratore in September. They brought the newly-formed Cultural Council on board and began planning the event. “The community really supported it and we have a lot of our students here at Naugatuck High School wanting to highlight their cultures, which is what we were looking for them to do,” Chuckrey said. Members of the Cultural Council also wanted to present their stories, she said. In addition to being educational, it was a great chance for people from different backgrounds to mingle and talk, Serratore said. “I think the people who made their presentations here were very happy to have the opportunity to talk about their culture. It was just a very, very nice evening. There’s a lot of happy people here that I saw walking around,” Serratore said.